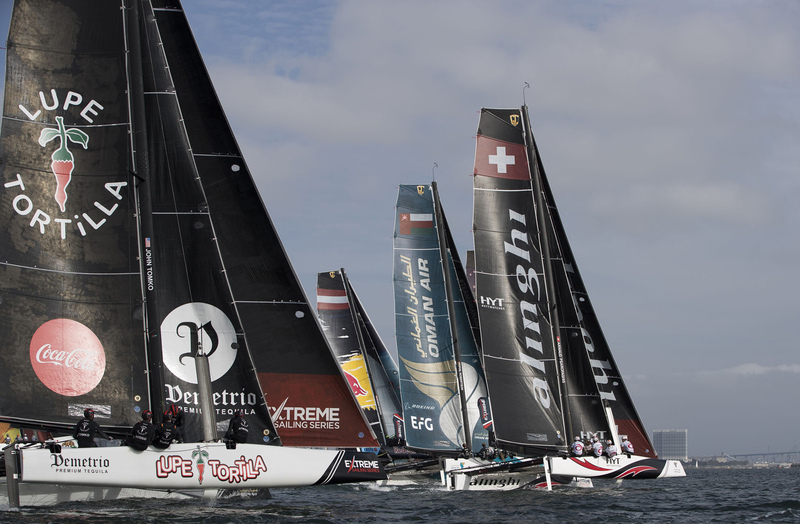 Images & report sent by Ryan Hall & Extreme Sailing Series . Tomko & the F18 US crew on board Demetrio Lupe Tortilla had their racing debut on the GC32s. They will need time to adapt, as no matter how you are, you need to get to know the beast. Same process the Arg F18 guys have to endure, and continue to experience. Alinghi leads, followed by Land Rover BAR, Ainslie at the helm. SAN DIEGO, Oct. 19, 2017 – Alinghi and Land Rover BAR Academy were the teams to beat on the opening day of the penultimate Act of the 2017 Extreme Sailing Series™ in San Diego on Thursday. But it was the Swiss who demonstrated their prowess in the light winds and took the overnight lead as they left the Brits floundering in the final race. For Alinghi’s helm Arnaud Psarofaghis it was a good day at the office. The defending champion currently sits in third on the overall leader board and the pressure is on as it nears the end of the season. lucky moves when we read the racecourse quite nicely, even coming back from an OCS start [over the line early], but it’s only the first day so we’ll have to sail better tomorrow as well,” said Psarofaghis, whose team now holds a five-point lead. 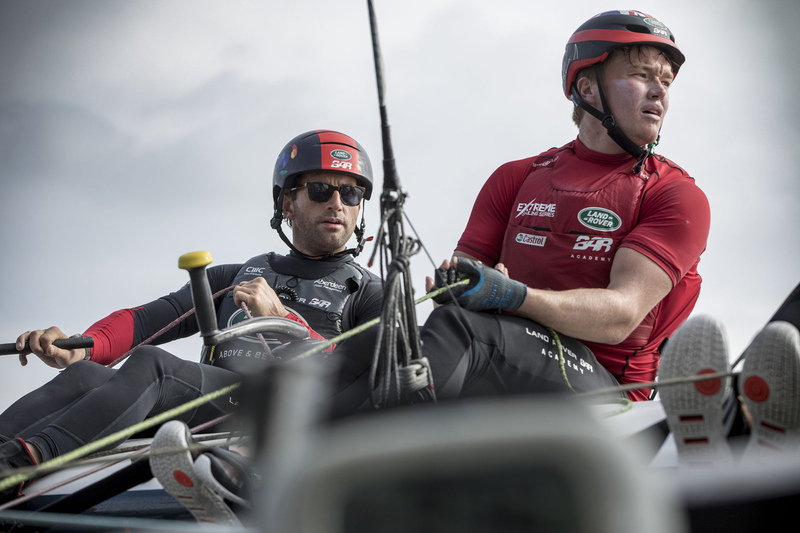 Land Rover BAR Academy – helmed by four-time Olympic gold medalist Ben Ainslie – also put in a strong performance which almost matched Alinghi’s. Going into the final race the two were tied on points but, as Alinghi crossed the line in first, the wind died and the Brits were unable to complete the course in the allotted time and did not finish. “The conditions today were quite light but it was a good day for our team. It’s the first day of racing in a GC32 in the Extreme Sailing Series for me and it’s great to be with the Land Rover BAR Academy team,” commented Ainslie. “I think the guys are sailing the boat pretty well. Probably myself steering and certainly getting off the start line always helps in this fleet. I thought we gelled together well as a team and for sure we can make some improvements for tomorrow and have some more good racing - I’m looking forward to it,” he added. For Adam Minoprio, helm of current Series leader SAP Extreme Sailing Team, things did not quite go to plan. Their moment of glory came in the final windless race of the day where they found a breath of wind to carry them past Oman Air and over the line in second, to rapturous applause from the crowd. “It was a pretty bad start for us, it didn’t feel like we were sailing well at all and then we got a bit more breeze and had the best race of the day for us. In the last race, we managed to spring our way back with a bit of luck at the end,” said Minoprio, whose team took third. Oman Air, who currently sits in second overall, missed out on the podium by two points while Team Extreme San Diego, the Californian wildcard squad skippered by former Series champion Morgan Larson, finished fifth. Despite a win in race four, Red Bull Sailing Team took sixth and NZ Extreme Sailing Team seventh. The second US wildcard Lupe Tortilla Demetrio, a brand-new team to compete on the boat and in the Series, took eighth. 17-year-old Toni Vodisek was the champion of the day in the inaugural Extreme San Diego Kiteboarding Invitational. The 15 international kiteboarders took to San Diego Bay and put on a foiling spectacle for the crowds in the Race Village. They will resume racing tomorrow at noon PDT. 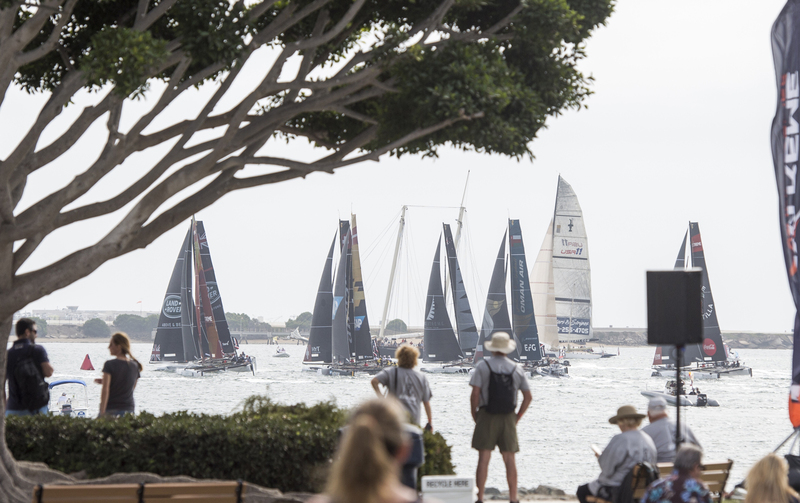 The GC32 Stadium Racing kicks off tomorrow at 2 p.m. PDT. The free-to-enter public Race Village is open from 10 a.m. local time with plenty of entertainment scheduled throughout the day. Fans can stay up to date remotely via the live blog. Fans can follow the action via the official Extreme Sailing Series social media accounts and the live blog on Friday. Racing will be streamed live on Facebook and YouTube on Saturday and Sunday from 2- 5 p.m. PDT. Cox Communications will provide a live stream of racing action on Saturday and Sunday through yurview.com and US Sailing will stream the event on its Facebook page Saturday and Sunday. For more event, ticket and parking information, visit sandiegoextremesailing.com. 1st Alinghi (SUI) Arnaud Psarofaghis, Nicolas Charbonnier, Timothé Lapauw, Nils Frei, Yves Detrey 64 points. 2nd Land Rover BAR Academy (GBR) Rob Bunce, Ben Ainslie, Adam Kay, Elliot Hanson, Will Alloway 59 points. 3rd SAP Extreme Sailing Team (DEN) Rasmus Køstner, Adam Minoprio, Mads Emil Stephensen, Pierluigi de Felice, Richard Mason 56 points. 4th Oman Air (OMA) Phil Robertson, Pete Greenhalgh, James Wierzbowski, Ed Smyth, Nasser Al Mashari 54 points. 5th Team Extreme San Diego (USA) Morgan Larson, Andrew Campbell, Matt Cassidy, Mike Kuschner, Cooper Dressler 49 points. 6th Red Bull Sailing Team (AUT) Roman Hagara, Hans Peter Steinacher, Stewart Dodson, Adam Piggott, Will Tiller 48 points. 7th NZ Extreme Sailing Team (NZL) Graeme Sutherland, Josh Junior, Harry Hull, Andy Maloney, Josh Salthouse 45 points. 8th Lupe Tortilla Demetrio (USA) John Tomko, Jonathan Atwood, Matthew Whitehead, Tripp Burd, Trevor Burd 36 points. 1st Tony Vodisek (SLO) 1 point. 2nd Julien Kernuer (FRA) 2 points. 3rd Oliver Bridge (GBR) 3 points. 4th Axel Mazella (FRA) 4 points. 5th Florian Gruber (GER) 5 points. 6th Joey Pasquali (USA) 6 points. 7th Riley Gibbs 7 points. 8th Nico Landaur (URU) 8 points. 9th Kai Calder (USA) 9 points. 10th Will Cyr (USA) 16 points. 11th Stefaans Viljoen (RSA) 16 points. 12th Johnny Heineken (USA) 16 points. 13th Bryan Lake (USA) 16 points. 14th Daniela Moroz (USA) 16 points. 15th Ty Reed (USA) 16 points.